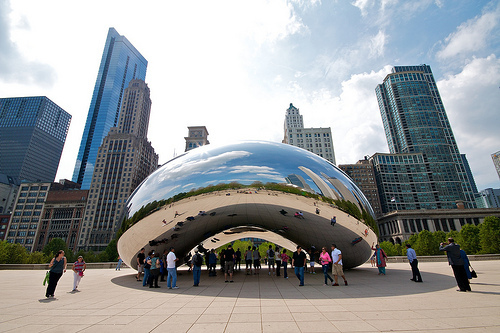 Cloud Gate, is a public work of art by Anish Kappor, an Indian-born British sculptor. The piece is located in Chicago’s Millennium Park near the conference venue. Last week I was pleased to attend the Eighth Annual IEEE International Conference on eScience at the Hyatt Regency on Chicago’s Magnificent Mile. With 225 registrants from ~25 countries from a variety of organizations and research domains, the group was wonderfully diverse, including a good number of female presenters and attendees. This year, the Ninth Annual Microsoft eScience Workshop, the Open Grid Forum 36, and the Twelfth Annual Global Lambda Integrated Facility meetings shared the venue. I heard there were ~50 who are involved with more than one of these groups and were able to make the most of their trip to Chicago—a welcome break since many organizations have drastically cut travel and conferencing budgets. In addition to those who support federated eInfrastructures, there were representatives from charitable foundations that support science, technology, engineering, and mathematics (STEM) initiatives and others from most research domains, the digital manufacturing realm, municipalities, and commercial providers of technical solutions. Many breaks and some evening activities were co-mingled offering the opportunity to meet people I would have otherwise never met. Yet, I also saw familiar faces from my work with the National Science Foundation’s (NSF) TeraGrid and through my experience as US Correspondent for the European Grid Infrastructure Community Forums, including EGI’s Steven Newhouse who also serves on STEM-Trek’s advisory board, the National Science Foundation eXtreme Digital Science and Engineering Environment's John Towns (STEM-Trek adviser), and Tom Tabor from Tabor Communications, Inc., the leading international media, advertising, and communications company that provides solutions, news, and information to the high performance computing, cloud, data-intensive, and digital manufacturing communities. Attending eScience was the perfect opportunity for me to tell stakeholders and potential supporters about STEM-Trek, a global, grassroots organization that will support travel and conferencing for STEM scholars from regions affected by the global economic crisis. Watch for more information about STEM-Trek when the project is launched in November. Until then, please join our FaceBook and/or LinkedIn communities where information will be shared. While the logistics of working with several organizations to plan a shared event were undoubtedly challenging, I hope the savings make the extra effort worthwhile. If there were any glitches, they weren’t apparent to me. Many thanks to General Conference Chair and STEM-Trek Adviser Ian Foster (UChicago/Argonne) for introducing STEM-Trek as a “friend of eScience” and to Program Co-Chair Daniel Katz (UChicago/Argonne) for inviting STEM-Trek and for attending the pop-up 'friendraising' event on Thursday. Kudos to the UChicago Computation Institute’s team, especially Julie Wulf-Knoerzer, Ninfa Mayorga, and Kristi Hamilton for their part in facilitating this important event. Congratulations to Kristi for winning the STEM-Trek 50/50 raffle prize on Thursday! Next year’s eScience conference will be held 22-25 October in Beijing. 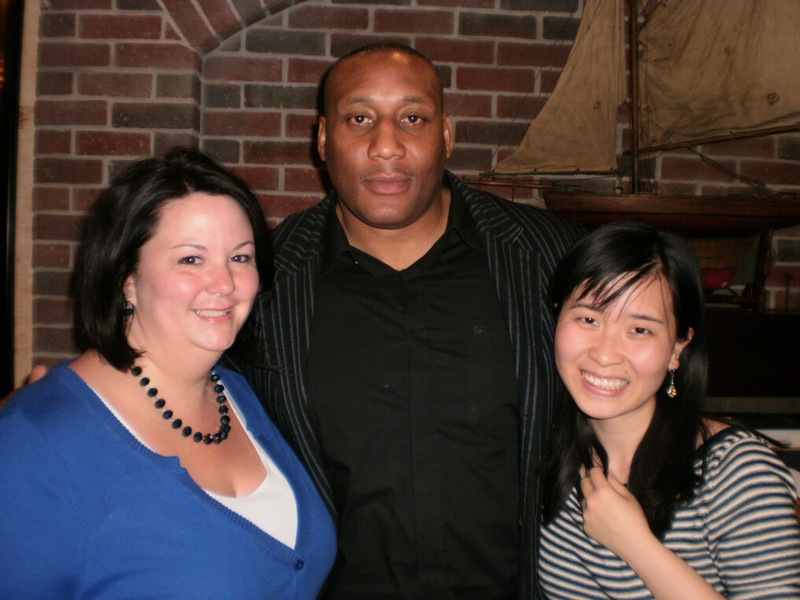 From left: STEM-Trek Builds Community event 50/50 raffle prize winner UChicago Computation Institute's Kristi Hamilton with guest celebrity Chicago's Danell "Doc" Nicholson (US Olympian, IBO world champion and World Sport Chicago mentor) and STEM-Trek beneficiary, Wa Yuan (Northwestern University).